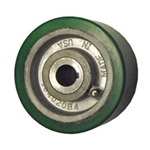 Service Caster manufactures keyed drive wheels commonly used to power equipment, conveyors and lifts through the use of polyurethane or rubber tread, friction keyway drive wheels also have many other uses in industrial settings. We can also supply you with replacement drive wheels for an existing application. Plus, Service Caster provides in-house capabilities for cutting any type and size key way, and rebonding services to bring old wheels back to useable operation. Service Caster drive wheels are made in the USA; machined, assembled and packed at our West Reading, PA facilities. 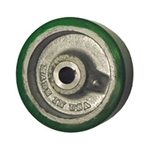 Our drive wheels are available in Standard and Metric width bores. Wheels ship with 2 set screws; one on the keyway and one 90 degrees from it. For more options or custom drive wheel sizes, including additional keyway and tread choices, contact our expert sales team in West Reading, PA. Please note: Due to the many unknown special uses of keyed drive wheels generating more stresses & RPM’s than encountered in freewheeling applications, product warranties do not apply. If you are unsure of your specific application we encourage you to contact one of our Key Wheel Specialists here at Service Caster Corporation.